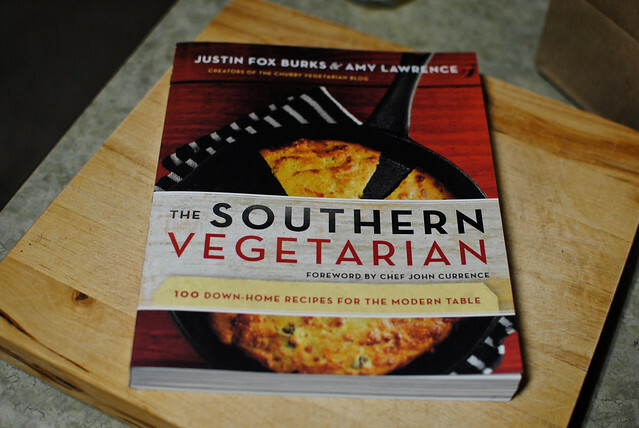 CW and I got this cookbook, The Southern Vegetarian, by Justin Fox Burks and Amy Lawrence, as part of our wedding gift from my friend Mel — she gave us several cookbooks, each representing a different region where one or both of us has lived, plus aprons (awesome gift). We’ve been using it a lot in the past few months and I figured I’d share a review of it for those of you who might be interested in a variety of tasty southern food made vegetarian. 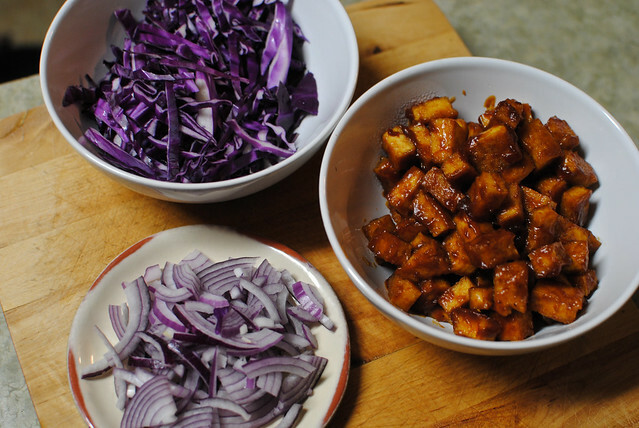 I found out that the cookbook stems from the writers’ blog, The Chubby Vegetarian, which I haven’t spent tons of time on (yet), but which appears to have a lot of good looking recipes as well, so I’ll be bookmarking that right about now. KW: My husband and I often trade off cooking duties during the week, but we really love cooking together whenever we get a chance. Working together in the kitchen with your spouse can be a lot of fun — and a little chaotic when you’re dancing around each other and trying not to spill hot food or drop knives. How does that work in your kitchen? Do you two do most of your cooking together? Any favorite things about cooking with your spouse — or pet peeves? Justin: We love to cook together. One of our favorite things is for Amy to start something, like a pot of beans in the slow-cooker or a baked sweet potato right from the oven, and I will come in and finish it. It works that way when I work late and we end up eating dinner at 9 or 9:30. Our 3 dogs are the main source of chaos in the kitchen. We don’t feed them any people food except the occasional piece of carrot or apple. They love it, so they are constantly begging. Amy: I love it when justin helps me make a quick dessert. I jokingly call him my sous chef. KW: I’m a vegetarian, and my husband is an omnivore, though he winds up eating mostly vegetarian at home. Most of our friends are also omnivores. 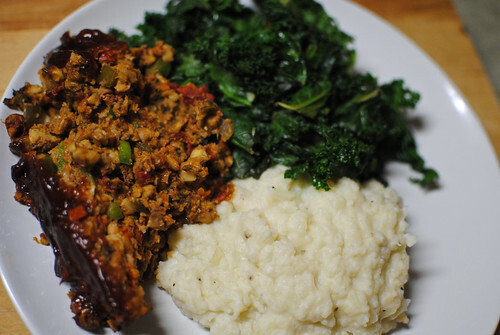 What’s your favorite dish to make for “mixed company” — something vegetarian that really satisfies even the most enthusiastic meat eaters? That’s our whole goal, for real! We make good hearty, healthy, satisfying food that happens to be vegetarian. We try to subvert the assumptions that people have when they hear the word “vegetarian.” They immediately assume that it about what’s missing; the meat. We think about it differently. We think about making delicious vegetable-based dishes with a ton of creativity. So, it become about what is on the plate and not about what isn’t. Sometimes they take their cues from meat dishes like our King Oyster Mushroom Scallops and other times the dish is just a product of our own imagination. I would say that pizza is the great equalizer. Sometimes “enthusiastic meat eaters” notice if there’s not a chicken wing or a piece of steak on the plate, but pizza can go meatless without a big fuss. We built a traditional Italian pizza oven in our backyard last year. We love to serve fresh pizzas alongside lots of grilled veggies, olives, and maybe a roasted eggplant dip. It’s the perfect party! KW: Do you have any kitchen tools you couldn’t live without (beyond the basics, like knives, pots/pans)? 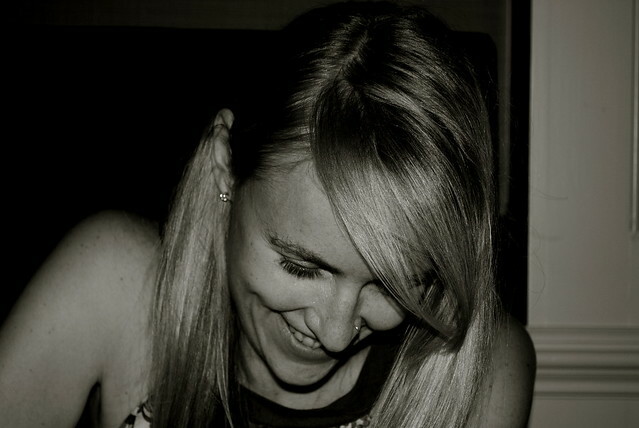 Amy: I really like to have mesh strainers. They double as a colander or sifter as well as straining bits out if a stock or retrieving greens from a pot of boiling, salted water. We like tools that perform more than one function. Justin: I’m a bit of a gear head in the kitchen. I was just given a Ninja blender after testing it for a TV spot. It’s become my new favorite toy. It can juice a watermelon in seconds and it make for the smoothest soups and sauces you’ve ever tried. Big thank you to Justin and Amy for the interview! I love what they say about vegetarian food being “about what is on the plate and not about what isn’t.” And pizza as the great equalizer? I absolutely believe it. 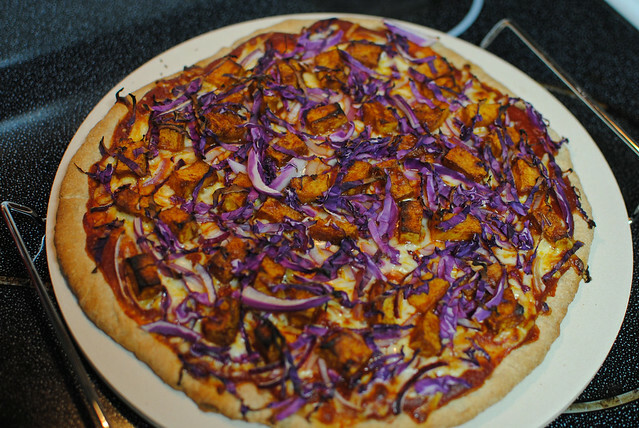 The first recipe I tried was this BBQ tofu pizza with a beer crust, and it’s now become one of our favorite pizzas and therefore a regular in our dinner rotation. The cookbook has a BBQ sauce recipe, but I have to confess to using sauce from one of our local BBQ restaurants for convenience. In my defense, it’s really good sauce. I also like to add red onions — they give it a little something-something. 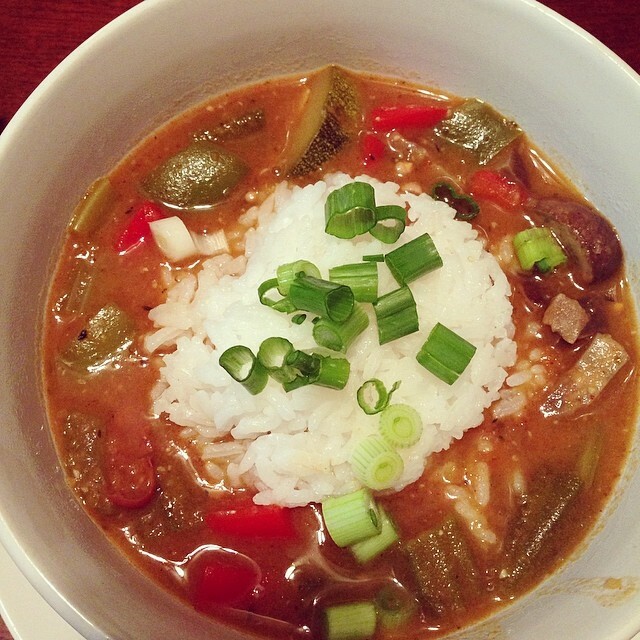 CW has made this gumbo twice now, and it’s definitely a favorite. He’s an omnivore and he says he might like it better with sausage or something added, but I love it as is and he’s happy enough to eat it vegetarian style, so. CW made this for the first time last week, and I am already lobbying for it to become a more regular item on the menu. The breaded and fried mushrooms are fantastic, and the gravy is by far the best version of any vegetarian/mushroom gravy I’ve tried. 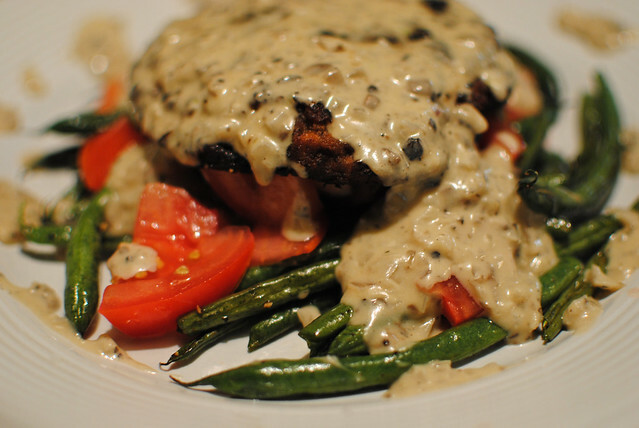 Here it’s served on green beans and tomatoes, but we thought this would also be really good with mashed potatoes and greens. 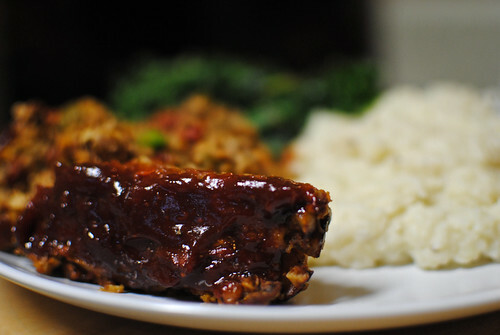 Most recently, I tried this meatloaf recipe. The loaf (I’m sorry, but I have to pause and snicker at the word “loaf” EVERY TIME), is composed of tempeh, walnuts, sun-dried tomatoes, mushrooms, carrots, celery, onion, and green peppers. It’s … a lot of chopping. They say you can food-process some of the ingredients, but not others– next time I may go rogue and dump it all in the processor. This recipe tastes GREAT, but the loaf fell apart when I tried to serve it. Leftovers from the fridge sliced up much more neatly, however (and were also delicious). I was frustrated by the structural integrity problems, but CW said it didn’t matter and he’d definitely want to eat this again, so I’ll probably just keep working on my technique over time. We have also tried a handful of other recipes that just haven’t been photographed– the Vegan Sloppy Joe, which is one of my favorites, especially with CW’s slaw, pickles, and chips; the Vegetarian Red Beans and Rice with Andouille Eggplant, which was really good, but we wound up having it the same week as the gumbo, so it didn’t stand out to us; and the BBQ Portobello Mushroom Sandwich, which is just a nice and tasty sandwich for your sandwiching needs. Some of the recipes, like the loaf, involve a little more prep time than we’d usually spend, but they’re still easy enough that anyone could make them. The prep is often just a lot of chopping and measuring herbs/spices. All in all, this has become one of our favorite cookbooks — if you’re looking to make some really tasty comfort food sans meat, I’d definitely recommend it. Excellent! That one looked great and really fit the theme. Glad to hear you’re finding a lot of good stuff in there and the authors sound lovely!